The rock band - comprised of Alex Trimble, Sam Halliday, and Kevin Baird - released their first album in four years last month, and have now opened up about the lack of "communication" between them that almost ruined them before the album was released. Frontman Alex, told NME magazine: "Communication had broken down through being in each other's company constantly for years. "It's hard to communicate when you just want to escape. The hard work, for all of the damage it does, is undoubtedly beneficial. But it also generates a fear that if you stop, then everything's going to go away. "It's 'living the dream', but you fear that once you have it, you could easily lose it. So that's what stopped us giving ourselves time to breathe." Sam, the band's guitarist, added: "We didn't have anything else outside of the band. "It makes everything seem so much more important, because you're there in it all the time. Stuff that really wasn't that big of a deal became a massive deal." Whilst bass player Kevin told the publication: "We began to realise we were very different people: we'd started to feel like we couldn't express ourselves individually and that we were always 'that guy from that band'." Alex also revealed that work on the album had to come to a halt for "two weeks" after he was sent to hospital when he suffered from stress-induced stomach ulcers. He added: "I was in there for two weeks. So that became the point where we had to stop." 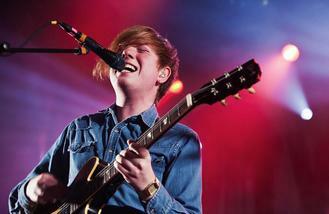 Two Door Cinema Club's 'Gameshow' was released on October 14, and is their first album since 'Beacon' in 2012.